The OD Shag Dance Team was invited to dance for Essentially Women Conference Focus on the Future Sunday September 25, 2016, at the Myrtle Beach Convention Center from 8:15PM thru 9:15PM. It was such a pleasure dancing for this group, because they were such an energetic group of ladies that we have ever danced for and with. Yes, these ladies came to learn to shag. If you get a chance go on their website and see what these women do professionally. After a semi-formal introduction with Sarah Conger Essentially Woman’s contact person and Nicole Mills the Events Coordinator, we were introduced to the band. While the Band – Inlyn Gruve started playing during dinner; the OD Shag Club Dance Team was in for a big surprise. The Band started playing at 8:00PM to a rhythm that was comfortable to dance to. Already there were ladies on the dance floor. At 8:15PM Linda Campbell introduced the OD Shag Club Members and gave a little history of the Shag Dance. She asked how many of the audience knew how to shag. Only one lady raised her hand half way. Then she asked how many would like to learn to shag. Half of the room raised their hands. It was then we knew we were in for a fun filled evening. Not only was the OD Shag Club able to dance for this group but we also instructed and taught the shag dance to a very enthusiastic group of ladies. A very special Thank You to Nicole Mills, Events and Sarah Conger, Essentially Women for inviting the OD Shag Club to dance at this event. Bob and Helon Page, Burnie and Donna Williams, Sonny and Tina Tomberlin, Barbara Hopper, Jay Kellerman, Jim Harley, Judy Odom, Linda Campbell and Lou Martino. 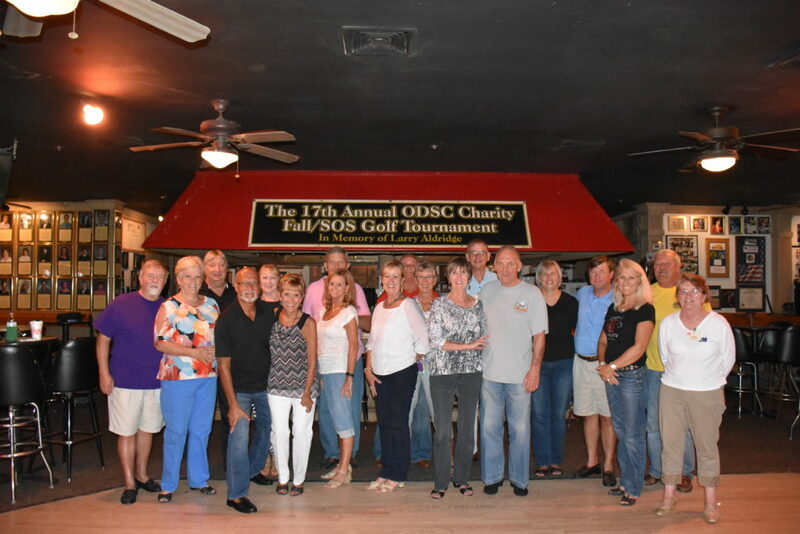 The ODSC had their drawing for the 2016 Golf Cart Fundraiser on Sunday, September 25th at Fat Harold’s. The winner for 2016 is Wayland Brown of North Myrtle Beach! The winning ticket was number 188 which Wayland purchased in the Spring. When we placed the call to Wayland, he did not believe us at first. Our Vice President, Terry McCoy, assured him several times and in a matter of minutes, Wayland joined us in front of Fat Harold’s to pick up his new ride. Thanks to Pam Moore for drawing our winning number. Pam is an employee of Fat Harold’s and for some reason had not purchased a ticket this year. I would like to thank all the club members and board members that help to sell tickets this year. We sold over 2,400 tickets. Many of our volunteers took several shifts selling tickets at St. Patrick’s Day, Spring SOS, Mayfest and Fall SOS. Our Vice President, Terry McCoy, sold tickets numerous times at Decker’s events. This fundraiser helps to support all the club activities and some of our charity giving. If you bought a ticket, we really appreciate your support. If you sold a ticket, we really appreciate your time and effort! Our 26th annual SOS/ODSC Charity Golf Tournament was again held at the Valley at Eastport Golf Club in Little River. Seventy two golfers took part on a beautiful day for golf. Everyone enjoyed meeting and greeting old and new friends. Golfers started arriving about 7:30. They were greeted by the ladies and presented goody bags as they were checked in. Liquid refreshments along with biscuits and donuts were available for everyone. Before hitting the links Geoffrey Girling welcomed the golfers and explained the rules of play. We were once again blessed with beautiful weather and following their round all golfers enjoyed a delicious BBQ lunch and social time as raffle ticket winners picked up their prizes. hole sponsors and raffle prizes. Many Club members participated in obtaining hole sponsors and raffle prizes as well as volunteering for certain duties on the day of the tournament. Each one helped make this years golf tournament as success. Without their help there would be no golf tournament. Our Club is fortunate to have each of these caring and participating members. As always special thanks to each of them for their dedication and participation. The Third day at the Shoe Center Fall SOS Concert brought a lesser crowd again due to the forecast calling for rain, but again the OD Shag Club Dance Team reported for duty and danced with The Rick Strickland Band playing for their captive audience. Lisa Hudson stole the show. What a singer and then she gets out there with the crowd and starts line dancing to her song Percolate. She has a lot of energy. Even though the OD Shag Club Dance Team only had five members dancing at this event, Lisa always recognizes us as part of the event. Thank you Lisa! It was another forecasted miserable day for the Shoe Center outdoor concert during Fall SOS. What to do should The OD Shag Club Dance Team go and dance in the rain or not? Several of the members decided to come even thought he weather man again said it was going to rain. However, yesterday had the same forecast so we took a chance and decided to show up for this event. Luck would have it no rain, well not until we were able to dance for about and hour. Just as we were ready to leave it did rain, but just a little not to scare any one off. Most everyone came prepared. So the band played on Gary Lowder and Smokin’ Hot were really drying up the rain with their steaming hot music. This audience loved to dance so we all danced almost in the rain. The day turned out to be a wonderful warm fall day, which along with the band and the OD Shag Club was most enjoyable. The forecast for Wednesday September 21, 2016, called for 80% chance of rain. The OD Shag Club Dance Team was scheduled to dance at the Shoe Center in North Myrtle Beach. Knowing this the skies above opened up and low and behold the sun came out as though the heavens knew that there was dancing to be done. Part of the team was blessed to dance for the crowd at the Shoe Center while listening to the Entertainers. Of course, the Entertainers are a very good band to dance to. Not only did we dance, but also there were the ladies who did several line dances and many of the audience did also participate. While waiting between songs to dance, Bob and Helon Page instructed members of the dance team on the River Waltz Step for couples. We were able to accomplish what we where suppose to plus we learned a little more steps on the side. If the weather holds for the next two days we will dance on Thursday and Friday. Who knows what the weather will be like? They say in South Carolina, if you wait 5 minutes the weather will change. So we will wait and see what happens. Wow! September was a busy month for the ODSC! Dance classes, bar crawls, dance team performing all over the Grand Strand, brunch, golf tournament, golf cart give away and I probably forgot a few events! One of our big events every September is the Golf Tournament. Please give Geoff Girling, Joyce Girling, Ken Meyer, Carol Meyer, Rich Young and Karen Young a hearty thank you when you talk to them. These 6 people and their teams spent countless hours collecting sponsorships, donations for raffle, setting up the golf tournament, signing up golfers and many other things to make this event go off without a hitch! If you have not been involved with this project in the past, you may be interested to know that they work on this for many months and I am very appreciative of their time and effort. I don’t have all the final numbers yet, but based on my calculations, after expenses, we raised over $8,500 for charities! On Sunday, September 25th, we had our drawing for the Golf Cart Fundraiser. Go to our news page to find the winner. I would like to thank my husband, Billy Powell, for all the work he put into this fundraiser. Also, I would like to thank each and every one who sold tickets and bought tickets to help support our shag club. This fundraiser helps to support our many activities and charities. I don’t have the final numbers on this yet, but based on my calculations…..it was an outstanding success. If you missed the brunch, you missed a great party. We gave new name tags to our all Al Cain Award winners so we can recognize all these important people who have contributed wonderful things to our club! Sam and Lisa West’s Junior Shagger’s performed for us. It was absolutely wonderful! Thank you for your generosity! With all the money thrown on the floor, you contributed over $500 to help them with their expenses as they compete around the country. Now, on to October…..our Election Party will be in October. We have a great slate for officers and board members. Go out to the website and read about all the candidates and be sure and attend the October party and vote! I will not be with you in October as I will be in Connecticut, but Terry McCoy will keep the party hopping! Stay tuned for updates on new lessons, share a shag step and other events. Hope you had a great September and an even better October! 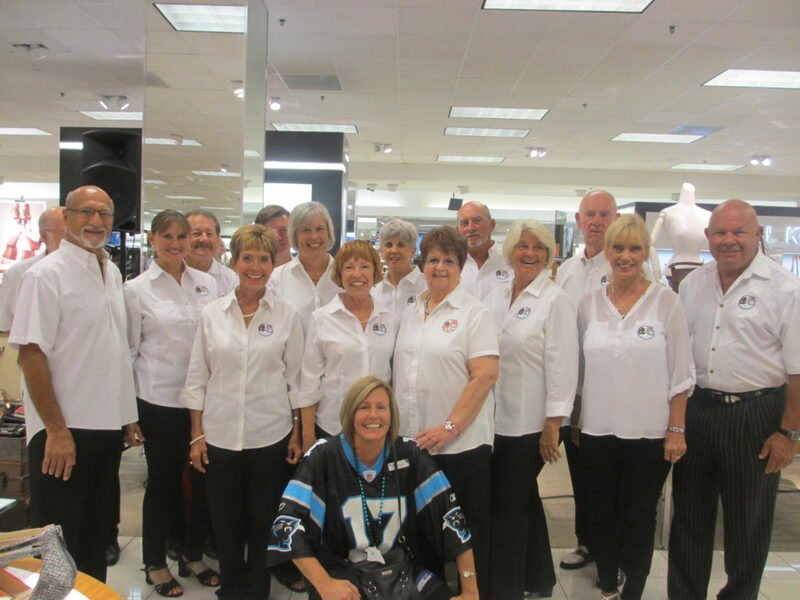 The OD Shag Team was asked to dance at Belk’s Shoe Sale at Myrtle Beach Mall on September 10, 2016, at 12 Noon until all the shoes were sold. As you can see by the pictures we had as great time and a great audience. Our spokes person Linda Campbell gave a short history of the Shag Dance and introduced each couple as they began to dance. The Staff at Belk’s are so wonderful to us. The Shoe Manager “Kerry” welcomed us with open arms and provided fruit and vegetable trays. The DJ of the day was Party Time Productions none other than Rich Hargrove. He had all of the songs that we wanted to dance to so we didn’t have to bother with the music. Thank you Rich! I would also like to thank our Cindy Day for setting up this event for the Team. Of course, I would like to thank the team members that took out time from their busy day to dance at this event. Thank you:Bill and Diane Millman, Jay Kellerman, Barbara Hopper, Diane Tindall, Bob and Helon Page, Linda Wilson, Lori and John Setzer, Linda Campbell, Jimmy Harley, Judy Odom, Vic Gillispie and Lou Martino and “Kerry” number 17. August was another good month for the ODSC! We had our Nomination Party and we have some great candidates. Please go out to the website and read everyone’s bio. This is a very experienced group of candidates! A group of us went to visit the South Strand Shag Club on our Bus to Somewhere trip. We had a great time and the South Strand Shag Club was extremely hospitable! The Cruise to Nowhere was also a big hit with a lot of our new members having their maiden voyage! We have started our Beginner II Lessons. Sonny and Tina Tomberlin are teaching the pivot, boogie walk, and other steps on Thursday evenings in the backroom of Fat Harold’s. Thank you Sonny and Tina for the time you are giving to our shag club! September will be a busy month for the ODSC. Just to mention a few items, we have SOS, Charity Golf Tournament, Brunch, SASS, Bar Crawls, giving away a golf cart. I guess I need to take my vitamins so I can get through September! We still need help manning the Merchandise tent and Golf Cart Raffle tent during SOS. Please sign up and work a shift. The shifts are only two hours and frankly, you meet other shag club members and have a good time! I would also encourage you to purchase a golf cart raffle ticket. This raffle helps to support all the fun things we do such as the Brunch you will enjoy in September. You never know, you might actually win a golf cart! The last ACSC meeting for 2016 will be held on Saturday, September 24th at the OD Resort. Any member of the ODSC is welcome to join me at the meeting. Just let me know so we can save you a seat! 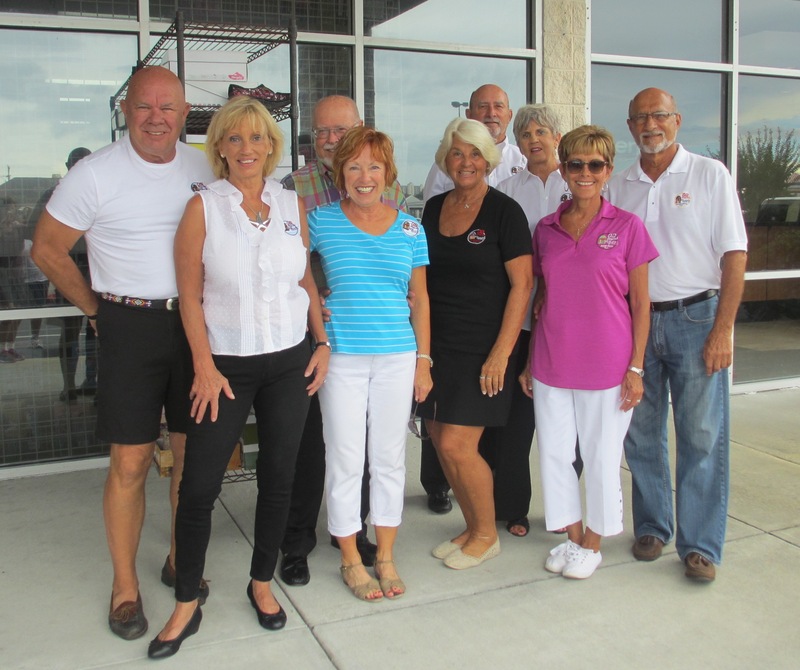 On Friday, August 26, 2016, the Ocean Drive Shag Club went on their annual Cruise to Nowhere on the Hurricane Fleet out of Calabash N.C. We had 88 guests there. Some paid but did not show. The weather was great,warm, but not hot. It was about a 2 hour trip, and I think everyone had a good time eating and socializing. Thanks to Bill and Joan Bacon for making this possible. Thanks also to Hurricane Fleet crew for getting us out and back safely. I wish to thank all of you for attending our 2016 Cruise to Nowhere, and until next year we hope you enjoy all that the ODSC has planned for us. Yes oh Yes it’s SOS and it is time again for the OD Shag Club Fall Brunch held at the OD Arcade. The rain didn’t deter some 324 shag club members and their guest from coming and enjoying the great music of Terry McPhail. As members and guests waited for Chris and his great staff to serve “adult beverages”, they were enjoying the coffee and conversations of catching up with those they hadn’t seen from last years Fall Brunch or even from the Spring Brunch. There was lots of laughter and smiles. It was especially exciting to see our “youngest at heart” member, Lenny Gardner, there as he had suffered a serious fall and is recovering and is now easing his way out some. Welcome Back Lenny! Before breakfast was served, President Monica Powell had a very special presentation to each of the past Al Cain award winners. As their names were called, she presented them with a new name badge, which indicated that they were the recipients of this prestigious award. Each was honored to be wearing these badges in the future to OD Shag Club events. As the food ticket colors were being announced and the snake of people lined around the dance floor, many people took advantage of the tunes being spun by DJ Terry and we all enjoyed watching them dance. As entertainment for the Brunch we were honored to have Sam West Jr troupe of dancers, the Shag Time II and the Wee Baby Blues. They entertained us with their awesome dancing and the crowd threw money on the floor to help support their travel expenses as they compete. We were all in awe with the incredible talent these young people have as several were just 7-8 years old all the way to 14-15 years old. If only we “seasoned” adults could move like that! The Name Tag Winner was Kathryn Wooten who was rewarded with $20 for remembering to wear her nametag. Yea! Peggy Lugan was given $20 for wearing her OD Shag Club logo and Diane Tindall went home with over $300 + for the 50/50 drawing. WooHoo! Thanks to all who bought 50/50 tickets. 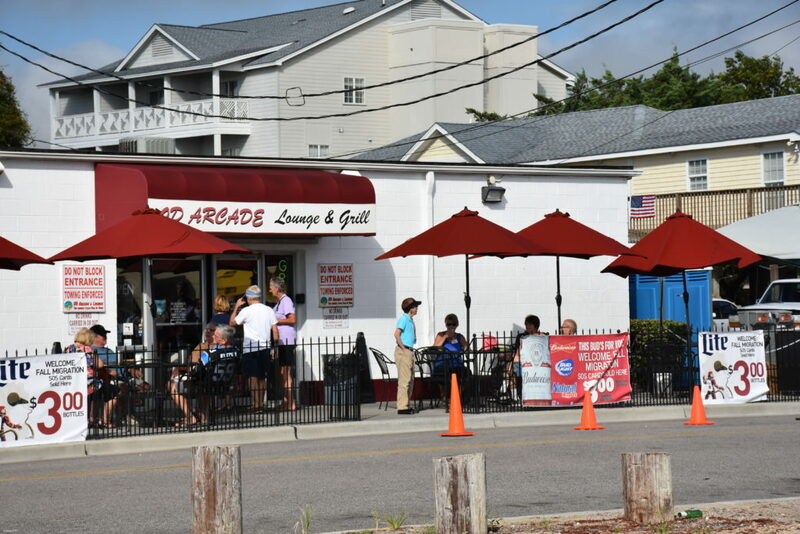 As the brunch was coming to a close it was reminded that we were having a Bar Crawl on Tuesday 9/20 starting at Pirates Cove at 6:00pm then transitioning to Fat Harolds. We will do it again on Thursday 09/22 starting at 6:00pm at the OD Arcade and then moving to Ducks, so come join us for some great fun, fellowship and of course so great shaggin’…..cause YES OH YES….ITS SOS!!! !